Screen casting 101: Online video tutorials for library instruction; Blogs, wikis, RSS and podcasting: Web 2.0 tools for academic librarians and educators; Virtual reference and instruction; Mobile computing; Beyond the keyboard: optimising technology spaces for collaborative learning, instruction and service; Libraries in the course management systems learning environment; Academic librarians in the age of videoconferencing: Tools for teaching, collaboration and professional development; Conclusion. This practical book introduces readers to the current technology topics and issues facing today’s academic instruction and reference librarians. 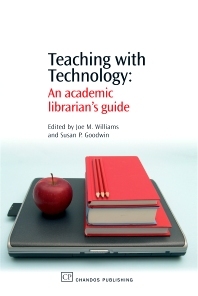 The book provides up-to-date overviews of cutting edge technologies, offers an insight on current educational uses and applications of these new tools, and discusses common problems and pitfalls librarians may encounter when incorporating current technologies into their instruction services. Chapters are written by experienced practitioners, providing detailed information on best practices and common pitfalls using today’s technologies. Topics include teaching with streaming video, chat-based virtual reference services, wireless networking, weblogs and course management software. Joe M. Williams is Assistant Professor and Manager of Education and Technology Services, Texas A&M University Libraries. He has several years’ experience integrating technologies with library services and delivering library instruction over the web. Susan P. Goodwin is Assistant Professor and Coordinator of Instructional Services, Texas A&M University Libraries. For the past five years she has developed and delivered instruction and information literacy initiatives for the University Libraries, and worked previously as a course developer for Athabasca University, Canada.